Someone put a 2080 Ti waterblock on this bad boy to confirm it works! 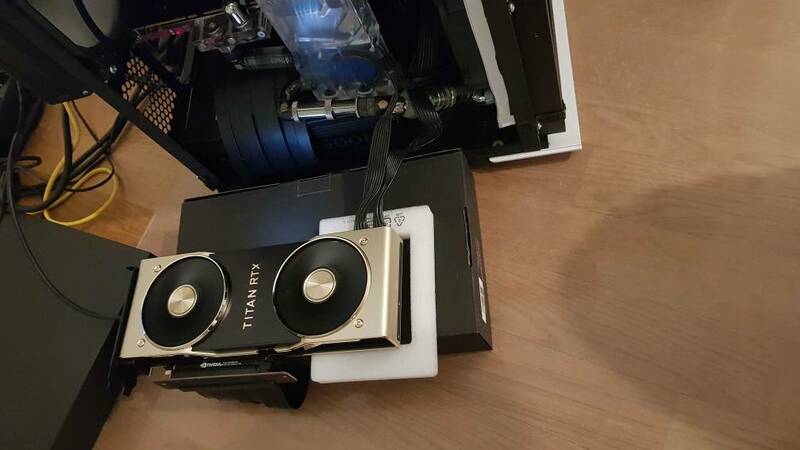 I’d like to get another block and put it right on my RTX Titan. Its Phanteks 60cm riser. The card under water in my build is atm a Titan V. I am pondering to order a 2080 ti watercool waterblock for the Titan RTX, it should fit I guess. Last edited by Zurv; 12-20-2018 at 12:51 PM. Nice! Dat golden NVLink tho. ...wondering whether someone will offer colour-matching (as in gold plated) water blocks ? ...it could happen ! I mean... hardware wise it is literally all the exact same stuff as the Geforce RTX cards, just a little bit more. but I'm also old. Does it video output? check. Can it render 3d games? check. You're really paying for the memory though, which games aren't going to make much use of. So far these aren't so great. Last edited by Zurv; 12-20-2018 at 01:33 PM. Did you actually expect miracle with 6-8% better specs which never scales 100% and limited Power on FE cooler? unless you really need extra VRam for "PRO" work this cards are waste of money, no matter how much money you have! This is false - with equal cooling the Titan does technically have superior grunt. If money is not part of the equation it is objectively better.